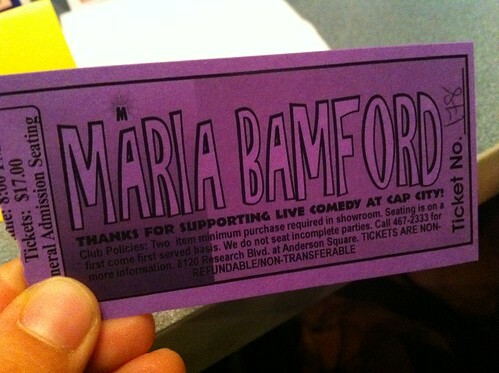 I have had a favorite comedian forever and her name is Maria Bamford. 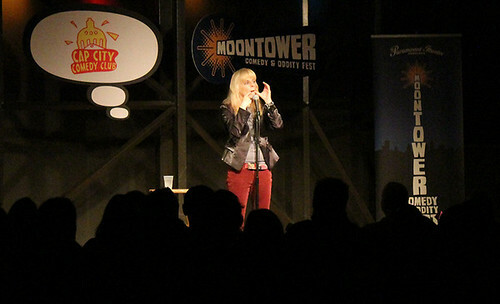 I have never seen a live comedy show (certainly not a professional one, anyway) before…and when I saw Maria Bamford was coming to Austin and I was going to be in town I jumped on it. She is right up my alley because she does an enormous range of voices and characters…some impersonations but mostly she has an incredible way of embodying 3 – 4 people at a time, so that she can tell a full on story with everyone’s voice involved. She can relate to us a 4-way conversation between herself, her father, mother, and sister…and you never get lost and you always know who is talking. This is hard. I stole this photo from someone’s blog because I was too chicken to take photos. Now I can’t remember who I stole it from. Shhhh. She’s also great with accents, another thing I am very fond of in a comedian. (I think I am supposed to say comedienne but it makes me twitch a little for some reason). The show was at Cap City Comedy Club and Katie went with me. Perhaps we peaked with seeing someone as cool as Maria, but I think live comedy might just be the cure for what ails all of us. I had a smile on my face for 2 hours straight and was full on crying/laughing for a big chunk of that time as well. It was a great endorphin rush and my face hurt all night. 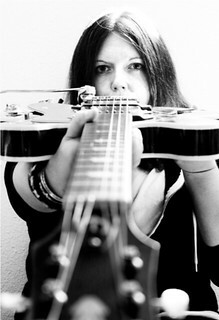 Here is Maria in action…go see her live!